Home > Uncategorized > News from Vermont #401 Burr Of All Trades…. Posted by Sara Garland | Aug 07, 2018 | Comments Off on News from Vermont #401 Burr Of All Trades…. Here I am in my dotage, actually thinkin’ of hangin’ up th’old Husqvarna. Yup, the other day I went out and cut a medium sized rock maple. It should’a been a simple job but “Murphy’s Law”, coupled with Murphy’s cousin, Stupidity, settled in at the first pull of the starter cord. The tree’s lean spoke “eastward ho” to me but “west” quickly won out. And that hardwood change of heart lodged my trusty Husky tightern’a, well, chainsaw in a bench vise. After several trips back to the shop for logging paraphernalia enough to “persuade” a giant sequoia, I finally succeeded in freeing the saw. Unfortunately the rock maple still stood upright, embraced by the limbs of his neighboring hemlock. 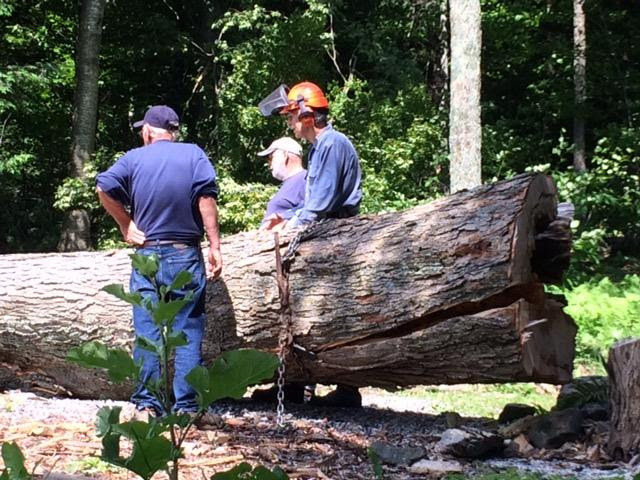 At that point, even though my genius woodsman friend Paul Cate has repeatedly told me not to do it, I proceeded to buck off 18 inch sections from the upright tree. Any chance that we could just pick this thing up and point it the other way…. Now one might think that dropping a whole tree a foot and a half at a time would quite quickly free it from a neighboring hemlock’s embrace but remember, Murphy’s still in complete control! Only after a trailer load of 18 inch sections had come off Tootsie Roll style and the tree was reduced to only a slender top, did it finally fall over. Following that level of “success”, this fool found himself slightly dazed and crawling out from under a wicked tangle of rock maple branches. And then for the piéce de résistance, this same fool, in the process of cutting up a mere smidgen of limb wood, proceeded to saw directly into one of his steel logging tools, ruining a brand new chain…enough! In the name of “winding down” in my dotage, in fact, I’ve been thinking about golf; not golf, mind you, with greens and fairways and folks in sharp clothing but “farm boy golf”. It’s a new and revolutionary game invented by “yours truly”. Here’s how it works: Every pickup truck has a ball hitch. Every trailer has a ball receptacle (meets the “golf” theme so far, right?) and every farm boy is a veritable pro at backing and hitching. Farm boy golf’s object is for the player, in the cab of a pickup, to back up to the trailer using only his mirrors. If he happens to land his ball hitch directly under the trailer receptacle on first try, It’s a hole in one. Repeated tries bring eagles, birdies, pars and bogeys. My good friend and fellow “Woodchuck Vermonter” Ed Hartman really liked my new game. He recently wrote a letter with his frustrations, however: “I am hooked on farm boy golf and I can’t afford it. My nice truck, only ten years old, is full of tailgate dents from various trailer tongues.” He went on, “I can’t afford a new tailgate and I sure as #@%& will not put a silver one on which is the only extra I have.”. Ranting on about beefing up bumpers and the like, he ended by asking how I am at welding. And so goes life. Most folks my age look forward to a long and fulfilling retirement. I suppose this old guy is no exception but I ain’t-a going to do it traditionally. My house’ll still be heated with wood, split and delivered wood which I’ll stack myself. Yup…can’t imagine life without a good woodpile close by. And as for my recreation, there’ll never be any green fees for this boy. Nope, I’ve already paid my fees for farm boy golf and I’m getting’ better all the time. FORE!